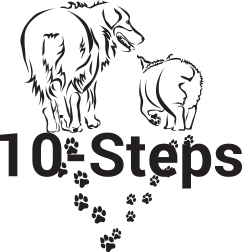 We invite individuals and breed clubs to participate in our 10-Steps program by abiding to ten simple-to-understand steps to express their dedication to the breeding of healthy Australian Shepherds. 10-Steps is open to anyone who loves the Australian Shepherd breed as well as to any Aussie breed club, national or regional. . We are happy to work with clubs in other breeds or species who would like to start their own 10-Steps programs and we welcome questions and comments. Package 1 ($10) – 10-Steps logo pin, color 10-Steps poster, ASHGI Lifeline e –newsletter and periodic updates and ASHGI news. Club Package ($15) – color 10-Steps poster suitable for framing, e-file of the 10-Steps logo that can be mounted on the club’s website, Facebook page, or used in club publications, ASHGI Lifeline e-newsletter and periodic updates and ASHGI news e-mail to keep your members up-to-date about ASHGI programs and events.